March 26th, 2013 05:25 PM | by Pasha | Events, Hunting, Uncategorized. Growing up on the northern edge of the Gulf Coast Prairie, I dreamed of someday being able to hunt the lands of my heroes, the rugged Rocky Mountains, the savannah of southern Africa, and even the forest and mountains of Europe. I devoured the articles in such magazines as Sports Afield, Field & Stream and, of course, Outdoor Life written by Jack O’Connor, Russell Annabel, Robert Ruark and others writers of the late 1950’s. With them, I enjoyed many an adventure as they stalked bighorn sheep, elk, moose, caribou or Cape buffalo and exotic greater kudu on the Dark Continent. With their unique and excellent writing style, I was there, right beside them, feeling the heat and cold, smelling the aromas of campfires, cowboy coffee and bacon sizzling in a pan. I dared dream that someday I could travel to those far off places and hunt as they did! I dreamed always of following the “Moon of the Painted Leaves,” as the fall was described so eloquently and descriptively by Russell Annabel! I was not the student I could have been in grade school or high school. I found the ballistics of firearms far more intriguing than the numbers teachers tried to instruct me in. I also found the pages of my “hunting magazines” far more interesting than the likes of assigned reading by Shakespeare, Keats, Lord Byron and others. The saving grace was those same teachers also thought Hemingway’s Old Man and the Sea, or even his Green Hill of Africa, were not all that bad. Thankfully! Fairly early in life, however, I realized if I was ever going to be able to do what I wanted, which was making a living with wildlife, hunting, the outdoors, and even writing, I would need to get a college degree. Yes there were writers and hunters without degrees, but it just seemed if I could get one of those things, my chances would be greatly increased. Admittedly, once again, I hated school, and even after I got into Texas A&M, had it not been for my bride, Mary Anne (we got married after our Freshman year at college), I would never have finished college. Few were the days I didn’t come home from classes, tell her to gather up everything we had (which at that time could easily have fit into two small suitcases), that we were going to leave this forsaken place. But thankfully, somehow, she talked me out of quitting and leaving. I am so very thankful she did, because without completing my degree in Wildlife Science, I would never have been able to do what I do these days… which I dearly love! I don’t thank her often enough for causing me stay in college! Kind of got off course there for a few moments… but it does give some background that lead me to where I am today. I started this to, among other things, talk about some of my hunts and one in particular, this past year, for my new “Dallas Safari Club’s Trailing the Hunter’s Moon” television show, which will debut in late June 2013 on Sportsman Channel. One of the primary airings will be on Saturday mornings. For the show, we hunted in Namibia, Africa; Manitoba, Canada; Kyrgyzstan; Colorado; Montana; New Mexico; Sonora, Mexico; and, of course, Texas. As this is being written in late January, we have completed “shooting” all but the thirteenth of thirteen episodes. That last hunt will be for desert bighorn sheep in Sonora, Mexico. Most all my life, starting at an early age, I dreamed of someday hunting desert bighorns, initiated by reading tales by Jack O’Connor and how he pursued desert sheep in Sonora, Mexico. Finally, thanks to the help and graciousness of Sonora Dark Horn Adventures, headquartered in Tucson, Arizona, I’ll have the opportunity to do so! This past hunting season unlike the many others in previous years, I spent very little time hunting white-tailed deer! I did hunt mule deer, which with me are a passion! I hunted the big-eared deer in Montana, New Mexico, and Sonora, Mexico. One of the hunts I’d done previously, and returned to again, is the High Desert Ranch (www.hdrmuledeerhunting.com) between Carrizozo and Corona, New Mexico. Here I’ve taken some extremely nice desert mule deer. High Desert is one of the most intensively managed ranches I know of when it comes to mule deer. And I mean that in a most complimentary way. Thanks to the efforts of the owner Steve Foutz and his son-in-law and ranch manager, Brian Cline, they are learning more about desert mule deer than most researchers have learned in the many years previous. In the process, they are producing some extremely large antlered buck, much larger than many previously dreamed they could. While on High Desert, which is not governed by New Mexico’s state laws because of its status as a Class A Game Park, I was able to take two bucks. The first one I hunted with my Ruger Super Blackhawk Hunter .44 Mag pistol. Brian and I set up in an area where the year previous I had taken an extremely nice 6×6 buck, about 27 inches wide, during the waning hours of my hunt with that same revolver. Now I was back. We watched several bucks feed across the opening around the waterhole; bucks that were a bit on the young side and in time would develop into absolute monstrous, 200 class bucks! Brian and I, along with my cameraman/field produce Derek Harris, admired those bucks and commented on their great antler development for their young age (Derek, like me, has a degree in wildlife from Texas A&M University). As we watched, we spotted another deer coming into the opening. There was no doubt he was huge of body and old! He cautiously walked toward a doe, but then lowered his head down in “airplaning manner” and made a run at her. Brian and I looked at each other. I started to speak to suggest we take that particular buck, but before I could, he said, “If you get a chance at him, take him! Don’t want him breeding any does. No doubt he done so in the past, but it’s time to take him out of the herd.” I nodded an affirmative! Carefully, I placed my Ruger Super Blackhawk Hunter in the crux of my BOG Gear, PSR rest. It locked in solid as if I was shooting from a sandbag rest! After cocking the hammer and the crosshairs settled on the buck’s shoulder, I gently pulled the trigger. 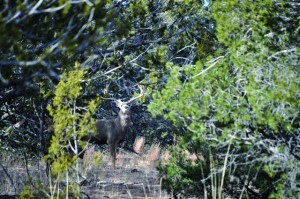 At the shot, the buck shuddered, started to run but got only a short distance before he was down. I could not have been more pleased or happy. The Hornady 240 grain XTP, which my revolver dearly loves and shoots more accurately than any other round, did its job superbly! With my “pistol buck” in the cooler, Brian suggested I take a buck with my Ruger Hawkeye African in .375 Ruger, the same I had used on African lion and Alaskan brown bear. Earlier, I had also taken a nice Canadian brown bear, a nice Colorado elk with that same rifle as well. Too, I had taken various African game such as eland (larger than our bull moose), and a regal 59 1/2 inch long greater kudu mere yards from the Botswana border in South Africa. We hunted hard and passed up several bucks, those which would, in time, be ‘monsters!” We walked miles looking for “the buck”. It was coming toward the 2nd to last afternoon of our hunt, actually the last afternoon because we had to fly back to Texas at noon the next day. We had walked all afternoon and the sun was just about to go down, but decided to trot to another part of the ranch where there was an opening and a waterhole. Just as the sun was about to go down, we set up under a cedar tree and started glassing several does, fawns and young bucks. It looked good for the home team and not so good for the visitors. In about five or six minutes, we would run out of camera light. Just then I happened to look far to my right. “Big buck!” was all I said as I madly tried to get into a prone position using my pack as a rest; Brian was using my BOG Gear shooting sticks to steady his binocular. Brian quickly looked at the buck. “About 250 yards! He’s a 5 x 5… ,” he hesitated, “Shooter! Take him if you can.” While he was making his assessment of the buck, I was busy grabbing Derek’s backpack to get a more solid rest. By the time I heard Brian instruct me to take him, I had my Zeiss Duralyt’s crosshairs on the buck’s shoulder, with the appropriate hold for that range. After a deep breath and letting it all out, I gently tugged the trigger. At the shot the buck kicked out and ran. 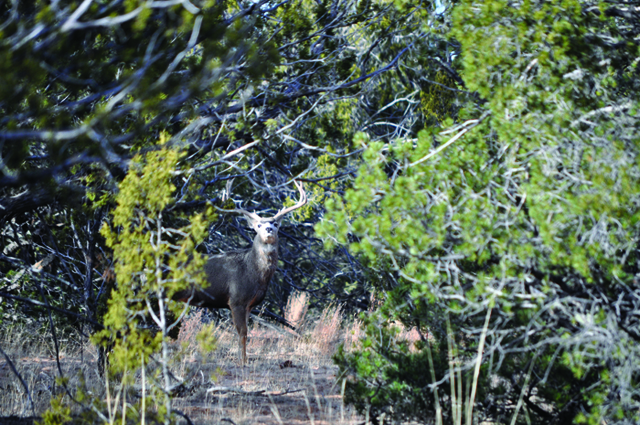 As I tried to reload, I watched him disappear into the dense pinon-cedar before I could get a second shot. A few minutes later, now dark, Brian and I walked to where the buck had disappeared. We found him 20 yards from where he had stood when I shot him. He was indeed a truly fine buck. 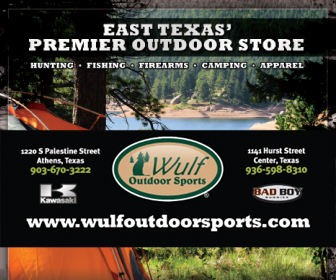 Like the title states, we were in “not quite East Texas”… Did I happen to say how much I like hunting mule deer?